When the PDA scans an item and gets a certain result, an audio cue will play from the PDA’s speakers or headset depending on the user’s preference. These audio cues are a good way to tell quickly whether an item is a good buy and are particularly useful if you are using a Bluetooth scanner with the PDA in a pocket or otherwise having its screen obstructed from view. Buy: This sound is played when a ‘BUY’ rating is given. Reject: Sounded when a ‘REJECT” rating is given. Not Found: Sounded when an item is Not Found in the database. You may get the words ‘Not found’. FBA: This sound will be played if your Trigger is set to look for an FBA offer and one is found as a Buy. No FBA: This sound will be played if your Trigger is set to look for an FBA offer and there are none. No Non FBA: This sound will be played if your Trigger is set to ignore FBA offers, and there are no Merchant Fulfilled offers lists. No New: This sound will be played if your Trigger is set to look for a new offer and there are none. 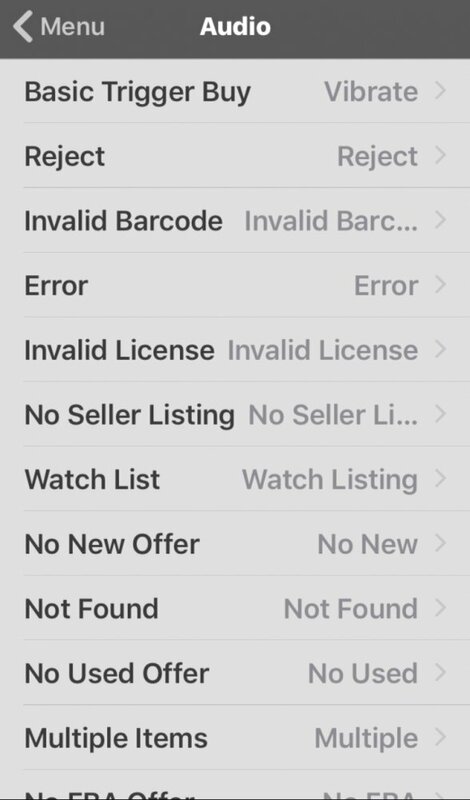 No Used: This sound will be played if your Trigger is set to look for a used offer and there are none. 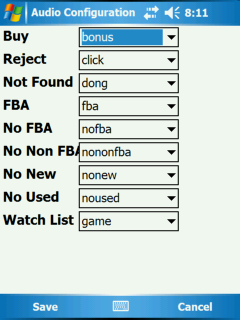 Watch List: This sound will be played when an item on your Watch List is scanned, providing that the Watch List has been enabled in Program Setting. *All categories here will need to be set to different sounds in order to function; setting any categories here to the same sounds will produce an error. *Additionally, if you find the sound is cut off before it can play fully, check your sound configuration by tapping the Menu button on the bottom left hand side, and select Minimize. Then, tap the Start Menu on the PDA’s top left hand side, followed by Settings, and then the Sounds & Notifications icon. On this screen, make sure all check boxes except for Programs are unchecked. 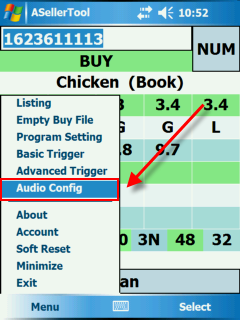 Save: Pressing this button on the bottom left will save the changes made to the audio configuration, and return you to the main screen. Cancel: Pressing this button on the bottom right will discard any changes made to the audio configuration, and return you to the main screen.